A great catechesis tool this Advent season! This beautiful pewter Advent wreath features the symbols of the Jesse Tree in 28 detailed panels engraved around an Advent ring. Each panel of the Jesse Tree represents significant events in salvation history (also known as the Biblical geneology of Jesus) leading up to His birth.This is a great Advent wreath to give as a gift to family and friends to help them not only celebrate the Advent season, but help them to understand more about how the birth of Jesus Christ is the culmination of God working His plan of salvation out through history as revealed in the Bible. This is a lovely advent wreath. I am looking forward to using it Advent 2019. The booklet with the explanation of the symbols around the wreath is very useful especially the Bible readings for each day. We will be reading the passages each day during Advent and lighting the candle(s). Ordered this beautiful Advent wreath several years ago and love it. The kids enjoy taking turns lighting the candles. I do wish the wreath came with an explanation of which reading each tile represents. Nevertheless, so glad I made this purchase - learning a lot! I'm so delighted with the Advent Wreath I purchased from The Catholic Company. I have waited a long time trying to find the "perfect" Advent Wreath for our home. The Wreath is so special because of the 28 engraved panels that show the events of our salvation history. I know that this Advent Wreath will bring my family and me lots of Christmas joy for many years to come. The Jesse tree advent wreath is a great idea. however there were cons. All candles were loose. The pewter was dark. The candles fell every time it was moved. It really needs a base to hold the candles. I'm from Australia and i order it on the last day of November and it got here Christmas eve. Expensive $$$ for what it is and we are not enjoying the advent wreath because of these problems. 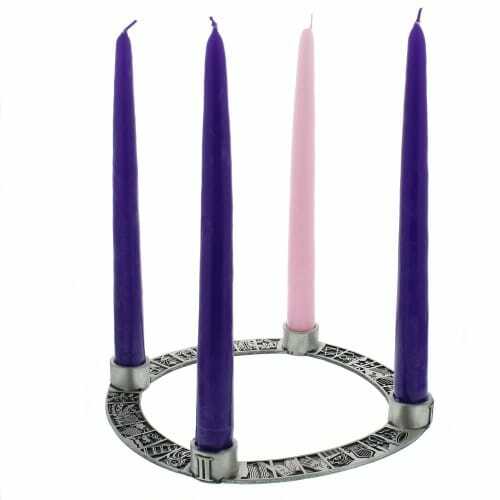 I ordered the Jesse Tree Advent Wreath becsuse I liked the idea of the Biblical journey through Advent. The wreath is simple and significant. My one disappointment was finding the attached candle holders were not closed on the bottoms. They are open circles on the bottom. If the candles don't fit snugly (the candles that were included don't) and if the wreath is lifted off the table the candles can slip through. Looking forward to using this next Sunday..1st Sunday of Advent and during December. Like the compactness and sturdiness of the wreath. Was hoping to incorporate the Jesse Tree symbols into our Advent prayers, but I have yet to find anything online that lists what each of the symbols represents. It would be VERY helpful if you included a pamphlet that explained what each of your symbols represents. I love this Advent wreath. I like the simple design-a good reminder of the simplicity we are called to during this season. It also comes with a pamphlet with the Jesse Tree readings. It's great for families just starting this Advent tradition. My family will be referring to the pamphlet and using this wreath for years to come. It is very meaningful, simple and elegant. This advent wreath is exactly what I had been looking for. A wonderful addition to our table for the special Christmas season. This is our third Advent with this wreath. I bought it because I fell in love with the design (the pewter reminded me of Norwegian pieces). The Jesse Tree symbols and verses add much meaning to our Advent family time. I love reviewing God's scarlet thread of redemption with my family. Although not the least expensive wreath to hold our candles, it has become a family treasure and in my estimation, is a good value.